The musicians of Jarana perform and teach from their home base Lincoln, Nebraska. Lead Daniel Martinez formed Jarana in 2009 for versatility and added creative energy. All shows are family-friendly. Lecture/demos are designed to suit the time and interest/age of the audience. Topics include South American music styles, Mexican folk music and Latin dance styles. 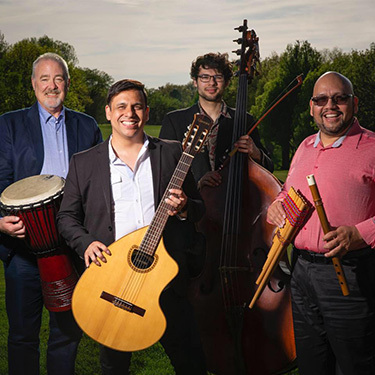 Jarana’s music blends South American, African and Mediterranean beats such as Flamenco, Rumba and Salsa, accompanied with authentic, traditional instruments. Band members are natives of Peru, Mexico and the US. Two of them teach at Lincoln colleges. Two have solo listings in the NTP Directory. Daniel Martinez is a guitar professor at Union College, Jeffrey Utter is an acoustic bass instructor at UNL. Each has experience adapting instruction for age and ability. They are comfortable teaching private lessons or in a group setting. Jarana’s shows energize audiences of all sizes and in settings ranging from festivals to sacred services. They appear as duo, trio or four-piece. They can customize their presentation to any occasion, but excel when playing world rhythms. Demo the differences between the styles and talk about their origin and development. Demo the various dance steps and the music that accompanies them. Best when presented with a dancer. The chemistry of Jarana is found in the way they listen to each other and improvise while playing. Daniel Martinez is a native of Peru and Oscar Rios of Mexico. Each is conversant in the folk traditions of their homelands and enjoy talking about seasonal customs, native traditions and world view.